With a second branch in Darwin, Mbantua Fine Art Gallery and Cultural Museum is a privately owned gallery in the heart of Alice Springs specializing in Aboriginal artworks. Buy everything from affordable souvenirs to investment-grade pieces by noted artists, via bark paintings, boomerangs, and gifts, or browse their permanent collection. Whether you’re admiring the permanent collection or seriously shopping, visit the Mbantua Fine Art Gallery free of charge. The selection of art is outstanding, with a focus on central Australia’s Utopia region. Paintings by some of Utopia’s finest artists also decorate Mbantua’s unique range of gifts, from mugs and candles to cushion covers and mouse pads. Travelers most often visit Mbantua independently, but the gallery is a must-see on any Alice Springs shopping tour or Red Centre art tour. 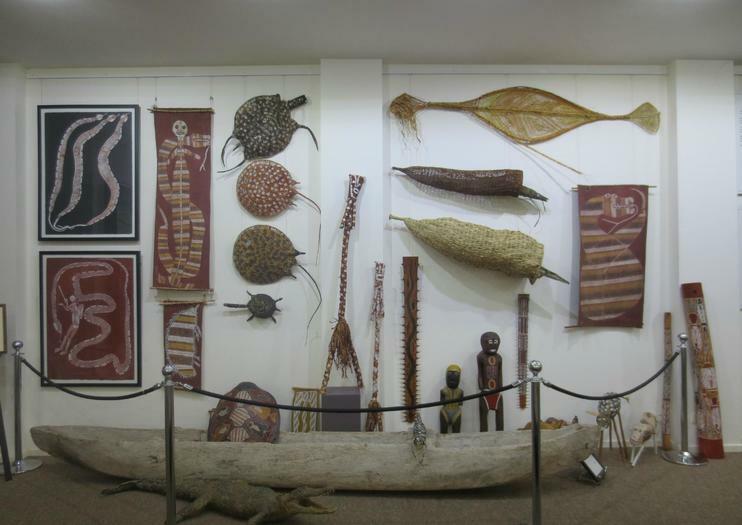 Mbantua Fine Art Gallery and Cultural Museum is a must for art lovers and fans of tribal items. Not all artworks are on display. Serious collectors should ask the staff for more information. The Mbantua gallery is at street level with wheelchair access. Mbantua Fine Art Gallery and Cultural Museum sits on Todd Mall, in the heart of downtown Alice Springs, around five minutes’ walk southeast of the Alice Springs Interchange bus station. It’s an easy walk from other downtown Alice attractions, such as the Alice Springs Reptile Centre and the Royal Flying Doctor Service. If you don’t have your own vehicle, buses 400 and 401 run along Larapinta Drive intermittently; get off at the post office. The Mbantua Fine Art Gallery and Cultural Museum is open morning to afternoon Monday to Friday, closing early on Saturday and with truncated hours on Sunday. During the hot season (November to April), it closes on Sunday. It also shuts for Australian public holidays: Christmas Day, Boxing Day, New Year’s Day, Good Friday, Easter Monday, and the allocated days off for Australia Day (January 26) and Anzac Day (April 25). Mbantua is the term used for Alice Springs in the Arrernte language, but the Mbantua gallery specializes in art from the Utopia region. An area covering around 1,930 square miles (5,000 square kilometers) northeast of Alice, Utopia is home to around 2,000 Aboriginal people. Art is the major source of employment in Utopia: Artists such as Ada Bird Petyarre, Gloria Petyarre, and Emily Kame Kngwarreye have been exhibited across Australia.